When it comes to sending and receiving mail, it's no secret that we're clearly big fans around here. There's just something about hearing the sound of the mail truck coming down our block, peeking out the window to see it pull up, waiting until it has pulled away (and then an extra pause or two so that it doesn't look like I have nothing better to do with my day than wait for the mail), and then heading out to pull open the box to see what might be waiting inside. So when it's time to send out my mail (especially for the holidays), I enjoy every part of the writing, sealing, addressing and stamping process except one: the return address. There's just something tedious about writing my address on envelopes and I never seem to be happy with the return address labels that I've printed or have made in the past... that just run out anyway. Instead, it is much easier to be excited to mail letters, cards and even bills, thanks to the Stampster from Invitation Consultants. 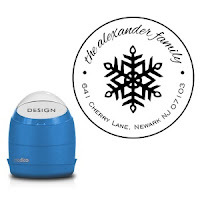 Carrying everything from wedding invitations to stationary to kids' party invitations, Invitation Consultants offers stylish and personalized products for just about every aspect of your life. But when it comes to their enormous selection of Custom Stamps, I hadn't realized just how many of their 55 designs I would like. Whether you're looking for simple, straight lines or unique, personality-filled patterns, the stamps at Invitation Consultants come in just about all of them. And although I would see myself mostly using the address stamps, the choices don't come to an end there. ...and many more. I love the way that Invitation Consultants makes it easy to customize your stamp in your choice of three colors as well as selecting the color of the ink itself from five different options. It's easy to enter in your information (or that of your recipient) and see a clear preview right on the website, as well as calculate the price every step of the way so that there is no surprise when it comes time to place your order. Even better, Invitation Consultants creates your stamp with the utmost consideration for the environment, meaning that there is no waste, litter or chemicals involved in the process. Instead, your final product will be unique, high quality, and last for years. Just think of all of the time and hand cramps saved not having to hand write your address or all of the money that won't be spent ordering and reordering address labels time and time again! The Stampster retails for $39.99, which might seem like a lot more than a sheet of address labels, but considering just how many times you'll use it over the years, that price seems quite reasonable. 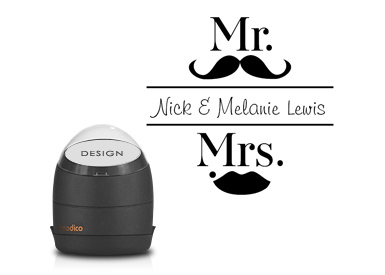 To enter to win: Visit Invitation Consultants and tell me which Stampster you would select if you win. 1 Extra Entry (per method) if you follow Invitation Consultants on Twitter and/or Like them on Facebook. 3 Extra Entries if you blog about this giveaway and link back to this post. Please leave an address where it can be found. Giveaway will end on November 28th at 11:59pm CST. By entering this sweepstakes, you are agreeing to these official rules. No purchase necessary, void where prohibited by law. Do me the favor of leaving an email address or making absolutely sure it is visible in your profile, I have to have a way to contact the winner. The winner will be chosen by random.org and announced here as well as emailed and will have 48 hours to contact me or respond to notification or a new winner will be chosen. The number of eligible entries received determines the odds of winning. This giveaway is open to residents of the U.S. and Canada only and must be 18 years of age or older. 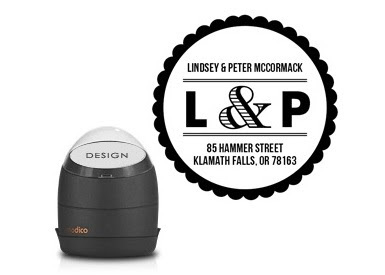 A big thank you to Invitation Consultants for providing a Stampster for one lucky giveaway winner. The opinions shared are my own and honest and if you really need to see more, click here to see how I roll. I love the "from the desk off" stampster. It would make a great gift for my son's teachers this Christmas. i love the snowflake stamp, but the to/from one is great too. It would be a tie, I'd have to close my eyes and pick! Script Monogram Stamp is nice. I actually love them all. Liked Invitation Consultants on Facebook. I like either the two you from me stamp or the initial stamp. I would pick the simple stamp. it's cute! I would get the To You From Me Stamper. entered teh Goblin Kids giveaway. entered the amazon.com gift card giveaway. entered the Magin Cabin giveaway. I would select the Modern Monogram Stamp. I have always wanted one of these. I entered the anamalz Box Set! i like the snowflake stamp. I love the Script Monogram stamp! 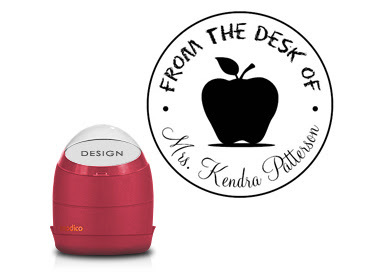 i would love to get the Good Teacher Stamp for my mom! I would get the simple stamper. I entered the BusyBodyBook giveaway. I like the simple stamp. I follow invitation consultants on Twitter as Hultsy! Modern Monogram would be great! I like invitation cons on FB! 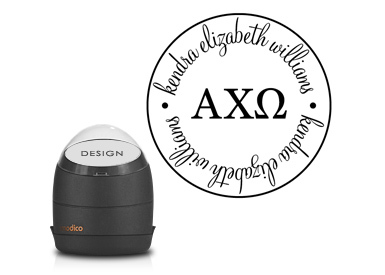 I'd choose the Capital Monogram stamper. Thanks. I love the Fall Leaf Stamp! I like the Simple Stamp. Great giveaway, just moved, so my previous address stamp is useless! Liked Invitation Consultants on Facebook! Entered the Omni bean bag chair giveaway. Entered the gumball machine giveaway.